Steve Venright, accompanied by his crew of Torpor Vigil Industries service technicians, hit the streets of Toronto in a heavily-equipped T. V. I. 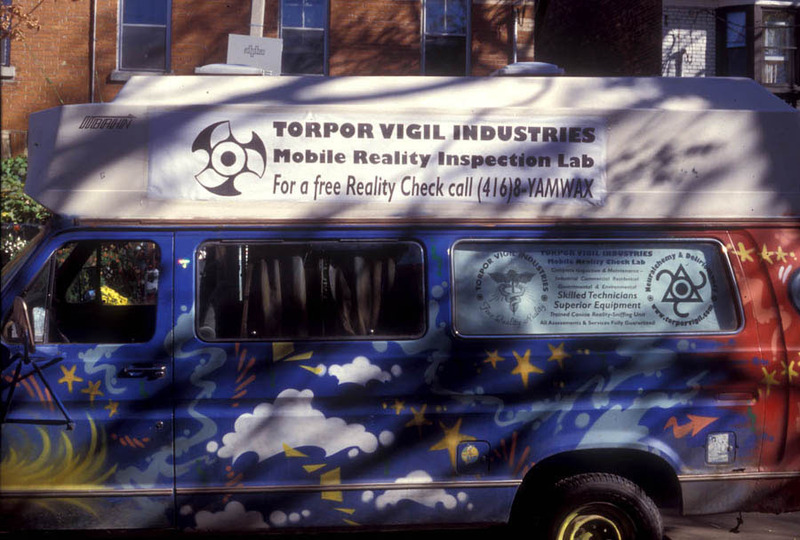 Mobile Laboratory van to conduct tests on the density and quality of reality at various metropolitan locations, including university classrooms, restaurants and even the mayor’s office at City Hall. In addition to random spot checks, the T. V. I. crew was on call via a published cell phone number for free residential, commercial, industrial and governmental “reality checks.” Appropriating the language and techniques of research scientists and service repairmen, and carrying an impressive array of homebrew reality-measuring devices, T. V. I. conducted a series of interventions into the urban landscape. Steve Venright is the author of four books of poetry in prose and is well known in the Toronto literary scene as both an author and organizer of events. He is also a visual artist whose works frequently appear in books, magazines, galleries, and cafes. Steve made his “performance art” debut in 1999 with the interventionary action Max 4s-10c (inspired by the forests and seas of Surrealist painter Max Ernst), a “transmutopian” poetic assault on the Toronto Eaton Centre.